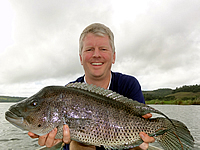 Costa Rica is a fishermen's paradise! They waters are teaming with sailfish, marlin, tuna and many other species. 2 full 8 hour days fishing including all gear, lunch, snacks and refreshments, 3 nights accommodation in Manual Antonio or Quepos, airport transfers. International air, departure tax, meals, tips and fishing license(Currently $25). Fri, Apr. 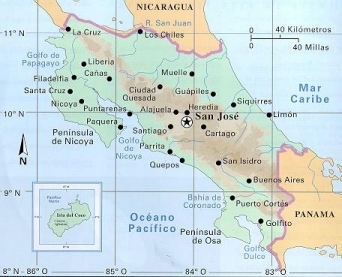 8, 2016  Welcome to Costa Rica! Upon arrival to San Jose International Airport (contact us for details if arriving at other airport), you will receive a VIP Airport Greeting by a Pacific Trade Winds representative. Private transportation (approx. 3 hours) will be provided to the Arenal Volcano area which is not only one of the most beautiful destinations in Central America, but also the Adventure Capital. During your visit to the Arenal Volcano area, you will stay at Arenal Springs Resort and Spa. Arenal Springs Resort and Spa is an eco-resort with thermal hot springs surrounded by tropical gardens located in the shadow of the imposing Arenal Volcano in the resort area outside of La Fortuna. Hotel amenities include thermal hot springs, swimming pools, restaurant, sushi bar, pizza cafe, bar, wet bar, internet access, spa, yoga platform and conference room. While at Arenal Springs Resort and Spa, you will enjoy a Junior Suite. Junior Suites feature air-conditioning, cable TV, ceiling fan, mini bar stocked with complimentary beverages for two people, telephone, in-room safe, hair dryer, and a terrace area with a view of Arenal Volcano. Day 02: Sat, Apr. 9, 2016  today you will enjoy a full day of guided sport fishing on Lake Arenal fishing for species such as Guapote and Machacca. Guapote bite similar to small mouth bass and many fishermen refer to them as Rainbow Bass due to their colorings, size, and appetite. Both species grow up to 10 pounds or more, with average weights in the 3 to 4 pound range. This full day, 8 hour tour includes transportation, guide, boat, tackle, gear, and lunch. A) The Hanging Bridges offer an amazing glimpse into the canopy of the rainforest! The hike includes terrestrial trails and bridges through the tree tops allowing you to view the forest from all perspectives. This fun filled half day tour includes guides, transportation and entrance to the private reserve. B) The Canopy Zipline is a MUST DO for anybody adventurous that visits Costa Rica! This thrilling high speed, high flying course offers 15 zips as you soar from platform to platform at the base of Arenal Volcano and then top it off with a Tarzan Swing! This fun filled half day adventure includes transportation and guide. Day 04: Mon, Apr. 11, 2016  Shuttle transportation (approx. 5.5 hours) will be provided to the Manuel Antonio area which is home to some of the most beautiful white sand, palm studded beaches in Costa Rica and an abundance of wildlife in the national park. Day 05: Tue, Apr. 12, 2016  Today you will enjoy a full day of inshore sport fishing on a 26 foot boat. You will be fishing for Dorado, Mahi Mahi, Snapper, Roosterfish and Wahoo just to name a few. This full day, 8 hour tour includes transportation, boat, captain, mate, bait, tackle, soft drinks and beer on board. Valid for up to 4 anglers. Does not include 15 dollar fishing license which must be paid in person on arrival. Day 06: Wed, Apr. 13, 2016  A full day of offshore sport fishing on a 26 foot boat. You will be fishing for Marlin, Sailfish, Yellowfin Tuna, Dorado, Mahi Mahi, Snapper, Roosterfish and Wahoo just to name a few. This full day, 8 hour tour includes transportation, boat, captain, mate, bait, tackle, lunch, soft drinks and beer on board. Valid for up to 4 anglers. Does not include 15 Dollar fishing license which must be paid in person on arrival. Day 07: Thu, Apr. 14, 2016  All good things must come to an end, though memories last a lifetime. Transportation (approx. 3 hours) will be provided back to San Jose International Airport scheduled to arrive three hours prior to your departure flight. So... The 700+ pound black marlin broke the line before we could get him into the boat. However, we were able to catch, photograph, and release the 400+ pound blue marlin. My son also caught a real nice 12 pound rainbow bass. Volcano Arenal erupted on us while we were fishing. Volcanic ash floated down upon us like small snowflakes. We then brushed off the ash (figuratively and literally) and returned our fishing. The photo of the volcano was taken immediately after it stopped erupting. Terrific vacation. 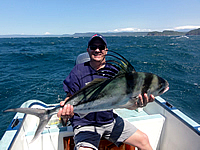 John W .
Hi Ed, Fishing,weather,pickups from arenal to manuel antonio were all great. Weather was clear for pictures of arneal volcanio. We caught rainbow bass and muchaca. In Quepos we went out the first day 45 miles out and each caught a nice sailfish and I also caught a 300 pound blue marlin. 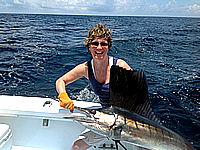 The next day we fished closer to shore off manuel antonio and each caught two rooster fish. I will send you some pictures when I get a chance. Thank you Larry and Cory!